Gargoyle geckos are the smallest member of the Rhacodactylus family. Adults only get to be about 5 inches long from head to tail. They come from the western and southern regions of New Caledonia, an island in the southern part of the Pacific Ocean. Gargoyle geckos are a very hardy species that does well in captivity; they live a long life and breed easily and readily. They also come in a variety of patterns and colors. Because of this they make excellent choices for either a first time herper or an investor. There are a few things that are required to keep your gecko happy in his new home. First, Gargoyle geckos are an arboreal (tree-climbing) species so it is better that their cage be tall rather then give them more ground space. Babies to juveniles can easily be housed in a large "Kritter Keeper" (12"x6"x9") that is turned so it is taller rather then longer. It is better that you house adults in 10-gallon aquariums or anything that is 20"x10"x12", turned so it is tall rather then wide of course. It is important that they are kept in smaller enclosures. Like other small gecko species they feel lost and intimidated in large housing. Multiple males should never be placed in the same cage. There are a huge variety of substrates (ground cover) out there to use for your animals. A few of them are poisonous and shouldn’t be used. These substrates are cedar and pine. It is my personal preference to use any kind of wood chips or mulch, cypress mulch being my favorite. I add a layer of moss over the top of the mulch. If your aim to go for something simple and practical and care less about natural-looking environments then your best bet is to use paper towels. Gargoyles enjoy climbing and hiding (and climbing when hiding) so it is important they have ample opportunity to do both. This means giving them plenty of plastic plants, branches and vines. Of course it is very important that such decorative items are securely restrained so your animal isn’t harmed. Another requirement of Gargoyle geckos is a water dish with fresh water all the time. Baby and juvenile Gargoyle geckos require more protein in their diet then they require fruits. Babies and juveniles should be fed 4-6 Live Dubia Roaches or Live Meal Worms and a teaspoon of fruit-flavored (mostly peach and apricot) baby food. Both of them should be dusted with T-Rex crested gecko diet and/or Rep-Cal Calcium. As Gargoyle geckos get older the amount of fruit they eat should be increased while the amount of protein taken in is decreased. In New Caledonia it is 75-78° F during the day for most of the year. At night it is 72-75° F and during the winter the temperature drops to 60-64° F. They thrive at room temperature, I keep mine at a constant 73°. They also require high levels of humidity. To achieve this you should mist the cage with a spray bottle several times a day and keep water dish inside their cage. Cypress mulch, moss and plants will help trap the water and raise the humidity levels. 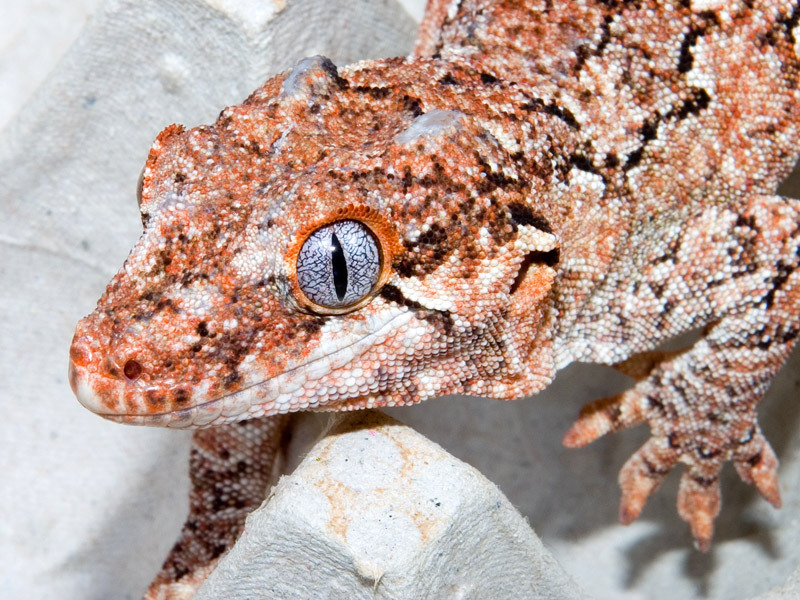 If you follow the care tips your gargoyle gecko very well could outlive the family dog. Their average lifespan is 10-15 years but could live for 20 years or more under optimal conditions. Good luck with your new reptile and happy herping!